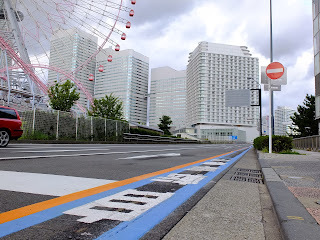 Last weekend I asked James Szypula from Yokohama Rides and Rentals if he could photograph the new painfully narrow bicycle lane in Yokohama that I wrote about last week in the article "Thanks for Half a Bicycle Lane Yokohama". "It really is a very short and narrow section of lane. The city probably saw a need to separate cyclists from pedestrians along this particular stretch, as it is often crowded with sightseers (often foreign so not used to seeing/interacting with bicycles on the sidewalk). " My concerns about the bicycle lane include its reported width of 1.2m ad the fact that almost half of that width isn't actually road space. To think that city planners are so woefully educated about protecting cyclists that they would include approximately 40cm of rainwater gutter when quoting the width of the lane is astonishing. When I asked James to photograph the lane I was specifically looking for drains in the gutter space and the photographs do prove that such drains exist. Cyclists swerving to avoid these obstacles will be seen by rivers as behaving in a dangerous and unpredictable manner and be put in unnecessary danger. "My main concern is that some inexperienced cyclists will be lured out into the lane and then right into one of the many raised reflective pavement markers which are at one end of the lane. These things are death traps IMO. Any cyclist hitting one of these will definitely go down hard and maybe fall into the path of traffic. Although reflective they actually are not so easy to see on a bike, especially at night." Parked cars! Now thats just rude. Anyone who has ridden at night knows that a bicycle light is sometimes not enough to illuminate these reflectors after they've been coated with grime from the road, and that hitting one, especially on a road bicycle, would result in disaster. Two more problems, which are not unique to this bicycle lane were motorists parking in the lane, and that after just 400m the lane stops and cyclists are once again left to fend for themselves on the road, or return to the sidewalk endangering pedestrians. Riding this lane is going to be a real test of your cycling skills! You can see more photographs of the Yokohama bicycle lane on Flickr. 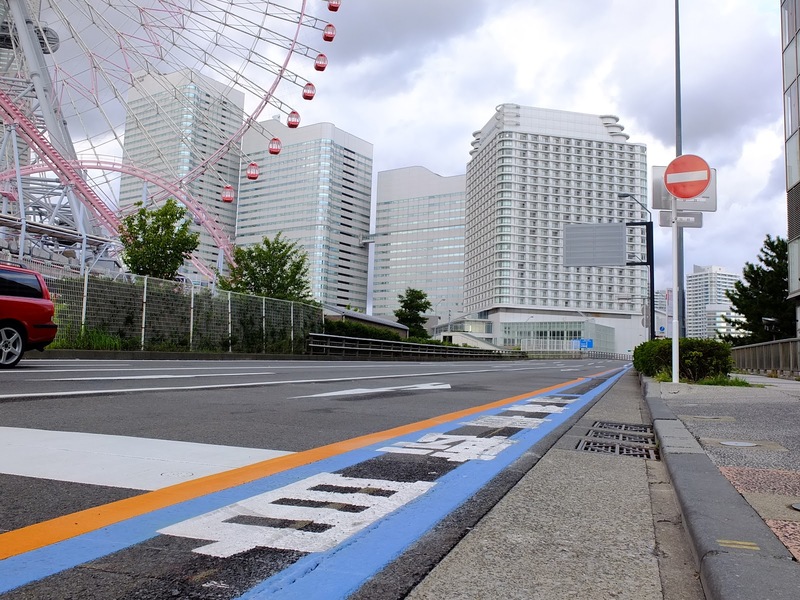 Ok as a Yokohama resident I have to say that the path is excellent there are no drains in the lane at all - unless of course the rider is actually riding IN the gutter and not in the blue section which is the cycle path. 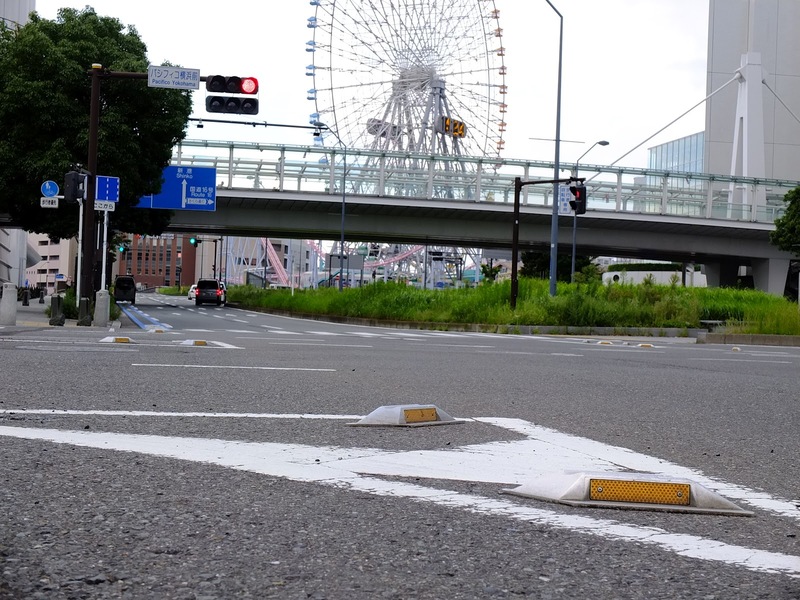 In regards to the raised reflectors - these are in the NO ENTRY areas of the road - that's what the black and white stripes mean. In regards to the width of the path - this is a two lane road that narrows in to a single lane, the path was built to assist riders through a series of junctions once you are clear of the 3 junctions the rider has the choice of using the road which traffic is seriously reduced or joining the footpath that is mostly 5 meters wide and legal to ride on. Real test of cycling skill? My 5 year old boy had no issues riding in this lane and navigating the sections. In regards to the path one bonus it has is that the stopping zone is ahead of the traffic making the cyclist more visible and reducing the risk or cars turning in to you - which is why the path was created. The parked car problem is one reason why I wonder about the practicality of bike lanes in Japan. Any road wide enough to accommodate a bike lane is going to have standing or parked cars. 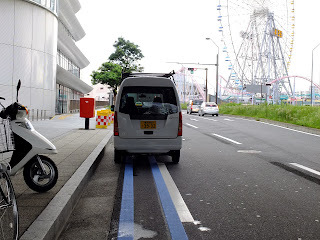 A cyclist has to constantly weave in and out of traffic avoiding parked cars. For convenience stores and delivery services, being able to temporarily stop in the middle of the road is totally essential to their business. Painting a bike lane doesn't solve this problem. Byron Kidd is the founder of the Tokyo By Bike website, writer, experienced urban cyclist, and expert on cycling in the staggering metropolis of Tokyo. How Many Japanese Cycle To Work?